A sermon preached by Christopher L. Webber at the Church of the Incarnation, San Francisco, on May 29, 2016. 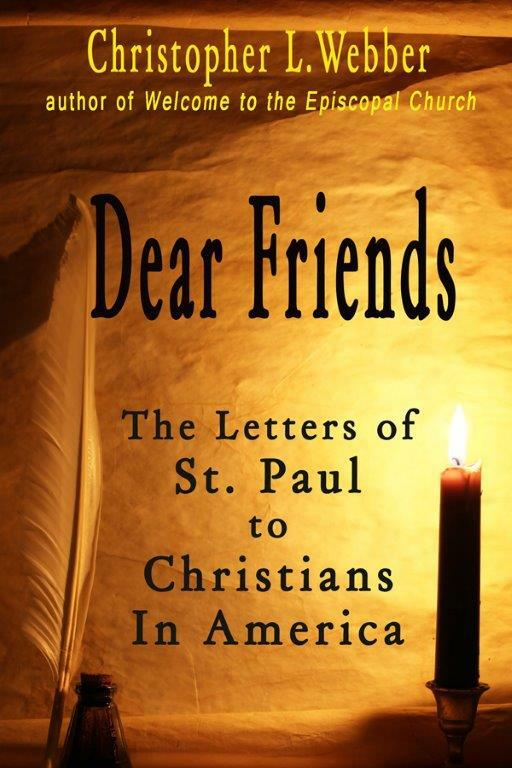 Last year as some of you know I wrote a book called “Dear Friends.” It’s a re-write of St Paul’s Epistles, imagining that he was writing today to churches in Washington DC and California and Florida and Texas. I had the most fun writing the one to Texas, probably because Texas is the only state in which I have never set foot, not even landed briefly in an airport. It’s always easier to write about something when you don’t know anything about it. But I do know some things and one of them is that Texas has come to symbolize a certain attitude that may be uniquely American – and yet not uniquely American because we find St Paul inveighing against it in a letter he wrote to some congregations of Christians in Asia almost two thousand years ago. The Galatians he wrote to were probably Celtic tribes living just north of territories fought over today by various sects of Syrians and Kurds and others: Christians and Muslims, Shiite and Sunni, and some of the issues are not really that different from issues we face today whether we face them in Syria or Texas or the Sunset district of San Francisco. They are issues, or attitudes, that will shape our upcoming presidential election. It’s about freedom and law, It’s about law and freedom. Paul could get angry at times and we see him at his angriest in this letter to the Galatians and we will be working through it the next five weeks when we read the epistle. There are six chapters in the epistle; and we have six weeks to read it. We have a lifetime to learn to live by it. But the essence of it is simple, a stark choice, the same choice we face in this year’s election: to live by law or to live in freedom, to be subject to law or to be free. Paul barely gets into it this week, but keep it in mind from now til the fourth of July: law vs. freedom: How do we shape our lives: Is it by law or is it by freedom? It’s appropriate that we come to the end of this reading from Galatians on Fourth of July weekend when we celebrate American freedom. Maybe we can come to it this year with a clearer sense of what that freedom is. And it’s bigger than American independence. Freedom from England is all very well, but for what? Freedom for what? That’s what Paul wants the Galatians to think about. Freedom for what? Christ has set you free, so what does it mean to live as free people? Freedom FROM is all very well but what is freedom for? What is freedom for? I think there’s no better way to answer that question than working carefully through this epistle and I don’t want to get ahead of the story. Sometime next month we will hear Paul say, “For freedom Christ has set us free.” It sounds as if freedom is an end in itself, but I don’t think so. I think it has a purpose. I think it’s a gift to use to shape all our relationships and to grow in love and worship. But let me begin by trying to put it in context. Paul was writing to Galatians, a Celtic group in what we would now call central Turkey, an area impacted now by tens of thousands of refugees desperately seeking freedom: freedom from killing and war, freedom from hunger and chaos, and freedom to be able to put down roots and find jobs and build families – things most of us take for granted – freedom for all of that. The lives of the Galatians, as far as we know, were a lot less chaotic than the lives of the people living there now. Then they had the stability provided by the Roman Empire, which gave them the freedom to live peacefully as long as they stayed within the rules and didn’t cause trouble. That’s a lot more than most people in that area have today. So when Paul wrote to the Galatians about freedom I don’t think political freedom was first in their minds. I mean, what chance do you have of gaining freedom when the armies of Rome are in control? And who wants political freedom as long as you have peace and security? Alexander Solzhenitsyn wrote of the peace and security of the prisoners in the Gulag Archipelago, the forced labor camps in Siberia, where every day was the same and they had no decisions to make or choices to worry about. As prisoners, they were free from all the pressures of living in freedom. The Galatians had that kind of freedom thanks to the Roman Empire. But some of them were converts to Judaism and they had learned the value of law in their relationship with God. Judaism in their religious life provided them with a structure just as Rome did in their political life. Judaism gave them laws that enabled them to bring their lives into obedience to the living God. But Paul was talking about freedom from that legal structure and a way to build new lives of faith in freedom. Over the next five weeks we will hear Paul telling them – and us – that the law was good to bring you to a knowledge of the living God, a relationship with the living God, but in Christ there’s no need of that structure, that system of law, the requirements of kosher and circumcision and keeping the Sabbath, because Christ has set you free. The great danger now is being drawn back to that reliance on law. You need to learn, Paul tells them, to live as free men and women so don’t fall back into reliance on law. Law can only take you so far but there’s much more growth possible in freedom. 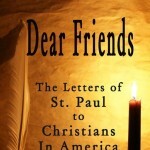 Now we come to this subject, this letter to the Galatians, as Americans and as Christians. We don’t read it as subjects of the Roman Empire or residents of the Gulag Archipelago, but as Americans, as people who talk a lot about freedom but are sometimes as much afraid of it as the Galatians. I think some of us are even more afraid of freedom than the Galatians were. It was only a couple of years ago that I was thinking about all this – maybe because I was working on that book I mentioned – my own version of Paul’s letters – and so I was thinking about freedom and wondering why so many Americans are so resistant to any kind of law – even laws intended for our good. I mean, freedom is all very well, some of us seem to be saying but aren’t there some limits? Those on both sides of the debate have issues with the law. What about, for example, laws intended to keep guns out of the hands of criminals and crazy people? Lots of us think it’s useful to limit our freedom to buy guns and use them. And what about laws intended to provide health care for those unable to afford it themselves? What about laws to protect the atmosphere and preserve life on the planet? Aren’t there times when we need to limit our freedom because it’s dangerous to have angry people with guns and dangerous to have factories belching out coal gas dangerous to try to live without health insurance. So we have one party pushing for laws to preserve us from those dangers and another political party dedicated freedom fro law regardless of consequeces. Some seek to keep us free from certain laws so we can shoot people and pollute the atmosphere and pay our own medical bills if we are able. There are millions of Americans very angry at the idea that government should place any limits on our freedom even for our own good. Why such fierce opposition? I was really puzzled by it as I said and it occurred to me for the first time – and it maybe should have been obvious – that a great many Americans came here – and still come here – to be free of tyrants. In the 18th century it was tyrants in England, Germany, and France. In the 19th century it was tyrants in Russia and Germany again or still and China and other countries. In the 20th century immigrants came, refugees came, from tyrannies in Germany – again – and Russia and Italy and Japan and China. Late in the 20th century and into the 21st century refugees have come from Cuba and have often joined a political party that warned of oppressive government because they knew about oppressive government and laws that deprived them of freedom. If you come to escape laws that made you victims, it’s maybe not surprising that you would have a deep suspicion of government and pass it on to your children and grandchildren. It might be hard to trust government when the only government you had known had been a tyranny. So I think I have some understanding of where we are today, why so many are so suspicious, so angry, so afraid of the government. It’s understandable that many Americans would instinctively resist any new laws that impinge on their lives however good the purpose. Add to that the fact that the Bible also – especially the New Testament, especially the writings of Paul, provides so negative an outlook on law. I think the passage we read today is very relevant. Paul begins with his usual greeting: “Grace to you and peace” and all that. Usually he goes on to say some nice things like “I have you in my prayers” Or “I have good memories of my visit to you” but to the Galatians he’s on their case right away. “I am astonished,” he writes, “that you are so quickly deserting the one who called you in the grace of Christ and are turning to a different gospel . . .” He has, as they, “issues.” And the issue is freedom. “Why have you abandoned the freedom we have as Christians?” I think he would ask that same question of 21st century American Christians. Why are so many of you giving up your freedom. You claim to be defending your freedom, but you arm yourselves with guns as if you were under attack; you claim to be free, but you pass law after law to limit human freedom, you enact a death penalty, you restrict access to abortion, you denounce illegal immigrants, you limit the freedom of others and limit your own freedom at the same time because people who live in fear of others are not free. One of the four freedoms that the western allies held up in World War II was “freedom from fear.” Guns don’t free us from fear; they create fear. Walls on our border are the evidence of fear. St John tells us “perfect love casts out fear. “Fearful Christians” is a contradiction in terms and that’s what St Paul is telling the Galatians We are not called to live in fear, behind walls, protected by guns but we are called to live unafraid in freedom because Christ has set us free. That’s Paul’s message to the Galatians and that is also Paul’s message to us. And it begins in the new life we have in Christ. That life also has a law, but that law is love: to love God and love our neighbor because Christ first loved us. And perfect love casts out fear. Why should we be afraid if God loves us? What is there to fear If God loves us? Who can do us any harm if God loves us? That’s the question Paul asks the Galatians and the same question Paul asks us. What are you afraid of? Isn’t this then the problem: that we have two kinds of law, laws that restrict us and laws that free us and two attitudes toward those laws. On the one hand those who are fearful of government and on the other those willing to trust government and each prepared to use laws to shape society toward their goals. Paul, I think, would say laws can never save us, whatever our politics laws cannot save us. But fear can imprison us. If Christ has set us free from fear that should enable us to work together to use laws to build a more just and free society. These are the issues to keep in mind as we read again Paul’s letter to the Galatians and Paul’s letter to us.